Trench warfare — or what could also be referred to as siege warfare — was forced upon the combatants for a number of other reasons. Unlike the situation in the East, the Western Front settled along a relatively short stretch of land. On either side of this bitterly fought over line were massive accumulations of armies — and the combined industrial strength of the primary combatants. But perhaps most importantly, the necessity of trench warfare emerged owing to the state of technology in the second decade of the 20th century. Indeed, it was an era that had seen rapid advances in metallurgy, chemistry, and high-precision mass production. Seemingly overnight, weapons technology had become immeasurably more advanced that it was just a few decades before. Among the new advancements, perhaps none was as potent as the new artillery. By 1914, artillery was equipped with hydraulic mechanisms for absorbing recoil, so they no longer had to be repositioned after every shot. The shells, which contained propellant, a warhead, and a timing device, could be directed at the enemy more rapidly, more accurately, and at greater range than anything seen before. It was artillery that dominated the Great War, killing more people from 1914 to 1918 than any other weapon. Along with the machine gun and grenades, these technologies turned the Western Front into a prolonged siege — but instead of defending castles, the modern armies of the 20th century were defending industrialized powers. When the war moved to the trenches, armies worked hard to produce new techniques to support the new system. Their aim was to find a way to avoid as many unnecessary casualties as possible. And indeed, trenches — though they're often seen as the harbinger of death — actually saved countless lives. That being said, and as the war progressed, the primary combattants of the Western Front became skeptical that the war could be won with a decisive military victory. As Winston Churchill noted, "The war will be ended by the exhaustion of nations rather than the victories of armies." Similarly, Germany's Erich Ludendorff became frustrated that his generals "had to renounce the vision of tangible victory." A Cheshire Regiment trench at the Somme. But the Allies and the Central Powers were not ready to call it quits. What's particularly remarkable — and even disturbing — about the Great War was how each side insisted on taking it to the enemy in hopes of eventually winning the struggle. The challenge for the generals was to turn a seemingly defensive system into something more offensive. As a consequence, and for the most part, each side attempted to exhaust the other — to sap the enemy of the will to fight, or to exhaust them of resources and manpower. Some generals remained convinced that a decisive breakthrough was possible — as witnessed by the catastrophes at The Battle of the Somme and the Nivelle Offensive — but most understood that it was simply a matter of wearing the enemy down. Perhaps the most potent example of this strategy was The Battle of Verdun — the longest sustained siege of the First World War. The super-concentrated assault was designed by Erich von Falkenhayn, and it was meant to drain France of its ability to fight. Indeed, Verdun itself had no strategic importance. Nor was any kind of breakthrough desired. The point was to simply turn the battlefield into a death machine. There are many misconceptions about the First World War. It's often imagined that the trenches were a pair of ditches that extended from the North Sea to Switzerland, and that soldiers were unceasingly asked to climb out of their trenches and engage the enemy in a futile battle. But the trenches weren't just protracted gullies — they were deep and elaborate systems. Both sides had different design philosophies that changed as the war progressed and as military needs demanded. What's more, the tactics that supported these defensive structures were more sophisticated than just "going over the top." On average, each side had 5,000 men per mile of front. The generals used this manpower to construct complex defensive systems that extended for miles behind the foremost trench. In order to confuse the enemy, and to prevent an enemy soldier from wreaking too much havoc after a breach, the trenches were dug-out as zigzag mazes and fortified in all the ways possible. First came the true front line, a trench six or more feet deep and about that wide, generally heavily manned. A mile or so to the rear was a support trench with a second concentration of troops. Farther back still, beyond the range of all but the biggest enemy artillery, was a third line for the reservers. All but the lightest guns were behind this reserve line, unreachable except by the most successful offensives. Trenches were often impossible to dig in the waterlogged soil of Flanders, where walls of sandbags had to be erected instead, and maintaining a continuous line could be difficult in the rough hills of north Switzerland. The German front "line" often included three parallel trenches, the first for sentries, another for the main force, the third for backup troops. However many such rows there were in any particular place, they were connected by perpendicular communications trenches, shielded by fields of barbed wire as much as thirty feet deep, and, more and more as the war wore on, studded with machine-gun nests. The trenches were less often straight than broken by dogleg turns, so than any enemy troops who got into them would have a limited field of fire. An aerial view of the Loos trench system, 1917. Note the zigzag patterns and extensive lines of communications trenches. Owing to the extremely poor conditions in the trenches, men were put on a rotation schedule. Like the trench system itself, these routines changed according to the demands of the war. But for the most part, soldiers spent no more than a week at the foremost trench. From there they would be pulled back to the support line, then to the reserve line, and finally to the rear. The pattern would then repeat. Between the two armies lay No Man's Land, a stretch of territory that measured anywhere from a half-mile to only a few yards. The land was shattered by shell holes, packed with barbed wire, and littered with dead bodies, debris, and the ghostly remnants of trees. Entering into No Man's Land during the day meant instant death, but it came to life at night. Raiding parties pulled night shifts, capturing prisoners for interrogation, spying on the enemy, and sometimes making a quick kill. With the physical parameters of trench warfare established, military planners then set their sights on engaging the enemy. Problem was, after making a relatively short advance, attacking soldiers would find themselves caught up in an energy-sapping fight within the enemy's labyrinthine and impossibly deep trench system. As early as 1915, and in an effort to overcome these issues, Allied forces began well-planned and thorough artillery barrages intended to destroy large sections of fixed defences and to demolish the enemy's barbed wire. It was the beginning of more "scientific" artillery technologies that would become standard. Artillery fire became a very carefully controlled and monitored process, governed by meticulous trigonometric calculations of range and trajectory. For example, the Allies introduced the concept of the "creeping barrage" in which a forward-moving wall of destruction would be followed by advancing troops. A great idea — at least in theory (later in the war, tanks, in conjunction with artillery, would produce this vital spearhead effect). Indeed, even the heaviest bombardment proved limited; mass artillery barrages often failed to cut the wire, and machine gun nests were quickly restored. It became painfully obvious that heavy artillery could stop an enemy advance. More munitions and guns, especially heavy guns, were seen as an answer to this, plus a longer bombardment to ensure that all targets were properly engaged. The attack also demonstrated that infantry elan still counted for much in the assault. It also confirmed that the momentum of an attack was best sustained by pushing deeply into the enemy's defences, rather than getting bogged down fighting for the front lines. These principles would form the foundation of First World War offensive tactical doctrines. The French were particularly enthusiastic about artillery. In 1917, generals Auat and Nivelle developed the idea of a "general reserve artillery" in which many pieces of all sizes of weaponry were grouped together at a specific place on the front. 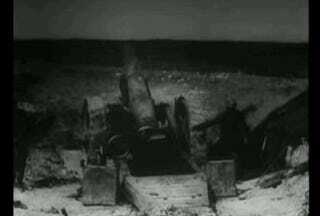 By the end of the war, the French had amassed an astonishing 5,000 75mm guns and 5,500 pieces of heavy artillery. Field manuals recommended meticulous artillery preparation and strong cooperation between the artillery and the infantry, in particular the posting of artillery observers to the front line so that they could accurately observe their falling shots and correct accordingly. Other weapons began to make an appearance, forever altering the nature of trench warfare. These included mine warfare (in which miners dug beneath enemy lines to lay tons upon tons of explosives), airplanes (mostly for surveillance), flamethrowers, poison gas (which had more of a terror effect than a tactical one — but still a deadly technological innovation), and tanks (which by 1918 were starting to be used by the Allies in a very Blitzkrieg sort of way). In its many forms — offensive, defensive, flammable, rifle — it proved to be extremely versatile. The defensive 'grid' grenade enabled the soldier to stop the assault of the enemy with sharp projectiles once he had reached a distance of 20 yards and was sheltered in his trench. The offensive grenade with a limited blast, silenced the opponent, especially in mine trenches. The French possessed a defensive grenade as early as 1914, but in the battles of the Argonne in particular, they relied on homemade gadgets such as 'firecracker rackets,' simple wooden boards wired and loaded with dynamite or melinite. Later, they developed more reliable grenades. By August 1916, after the failures of Verdun and the Somme, General Falkenhayn was relieved of his duties on the Western Front. He was replaced by the unit of Erich Ludendorff and Paul von Hindenburg, who replaced his super-wasteful war of attrition — the fatal attempts to "bleed France white" — with an entirely new defensive strategy aimed at prolonging and preserving Germany's position in the war. Most especially, and from that point on, all operations had to measured by the proportion of losses in men and material rather than the gain of territory (Germany was starting to feel the pinch of the blockade). The new doctrine advocated a more flexible defence. For this, the battlefield was now divided into two zones. The first was the forward zone, which would usually be surrendered to the enemy after a short period of resistance. This area stretched from the enemy lines to one's own main defensive positions. Under certain circumstances, this zone could also be evacuated without any resistance, so that the enemy would quickly enter the second zone, the area of main resistance. This zone was deep area into which the enemy would be dragged and which he would exhaust himself. Within this zone, often several kilometers deep, neatly created trenches that had given way to dugouts and concrete strongholds which served as the corset-bones of the defence. Resistance was to be conducted in a flexible manner, and it was expected that some defensive positions would be lost to the enemy in the course of the battle. This was not a major threat, as long as the German forces were able to keep the initiative and to mount counter-attacks which would eventually drive the enemy forces out of these positions. This "elastic" defense, which resulted in the formation of the Hindenburg Line, was quite remarkable. Unlike the Allies' rigid system, German defenders could now fall back, join the much stronger line of secondary defence, and assume superior positions to wear out the enemy. A glimpse of the Hindenburg Line after the war. After a few false starts (because some of Ludendorff's nervous officers failed to follow his exact instructions), the new system proved its worth. 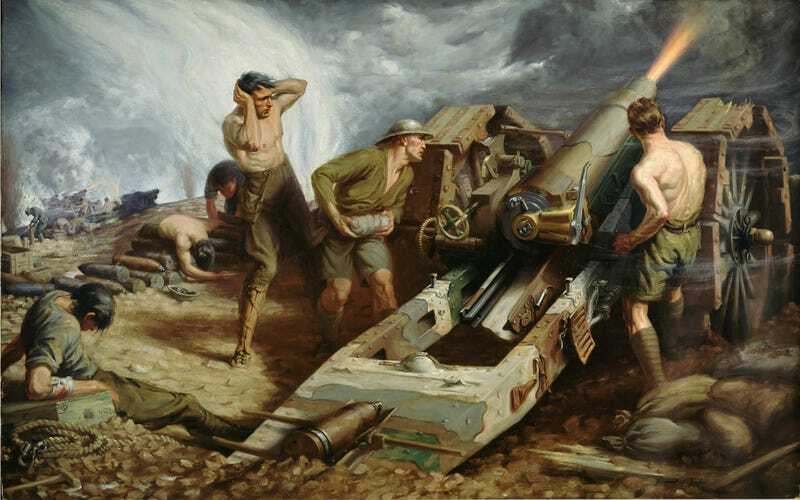 Perhaps the best example occurred on April 14, 1917 during a British assault. Moving behind the deadly curtain of a creeping artillery barrage, British soldiers quickly became bogged down by German artillery. The British advance was slowed down, and the infantry became separated from the support artillery. The German defenders then had enough time get into position once the British creeping barrage had gone over them. The Germans showered the British troops with bullets. Worse, the British troops were then surprised to encounter small-arms fire from German reverse slope positions and strongholds that had not been destroyed by the British artillery (it's very difficult to destroy positions behind a hill). Less than three hours into the attack, the British lost two-thirds of their strength and were forced back to their starting line. Two days later, Ludendorff's system wreaked havoc for the Allies during the Battle of Chemin des Dames, a part of the ill-fated Neville offensives. But it was not meant to be for Germany. Eager to defeat the Allies before the United States could make a meaningful impact in the war, Ludendorff organized the 1918 Michael offensive — an intense, if not vague, last gasp. After an initial stunning breakthrough in which stormtroopers were used to exploit breaches and opportunities, the Allies fought back, pushing the Germans back across conquered territory — including the Hindenburg Line. But it came at a terrible cost. Now that the war had emerged from the trenches, and with soldiers once again exposed, the final year would prove as deadly as the first. But the war of attrition had finally run its course. With Germany exhausted, and with revolution brewing, its military leaders decided to abandon the war. The importance of trench warfare, and all that was required to sustain it, clearly played a major role in the eventual outcome of the conflict.